Last weekend was a long-weekend, and some of my lovely family were visiting from out of town. So what’s a family to do but have a braai (the South African term for a barbecue)? Because it was a long-weekend, I had Monday as a bonus day all to myself before we went over to the braai, so I thought I’d spend the day puttering in the kitchen. Which is how this cake got a bit complicated, but so very very beautiful. 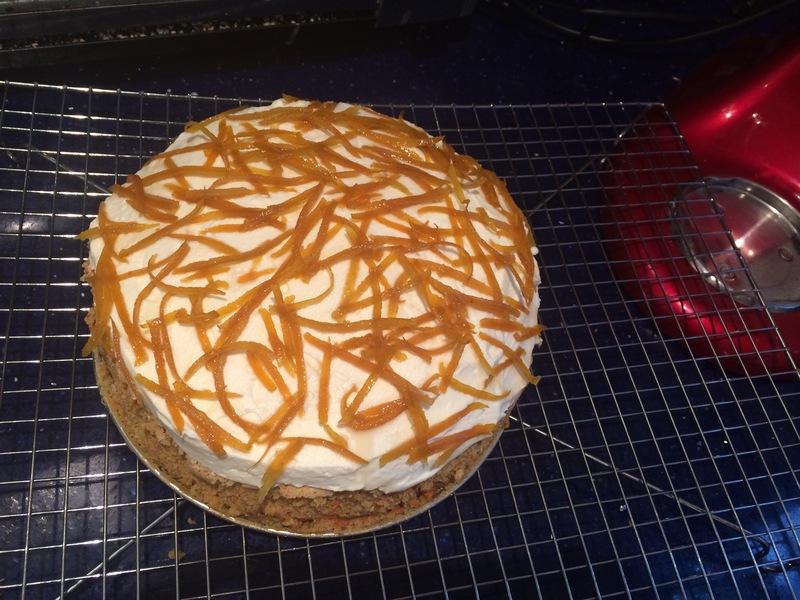 My sister, Heather, absolutely adores carrot cake, so I knew I needed a gluten-free one in my repertoire. I am so glad to now have this one up my sleeve! One of my favourite moments of the night was watching my two cousins (who are sisters) take over the kids’ leftovers. One of the sisters ate the extra cake, and the other ate the extra frosting. Now that’s what family is for! 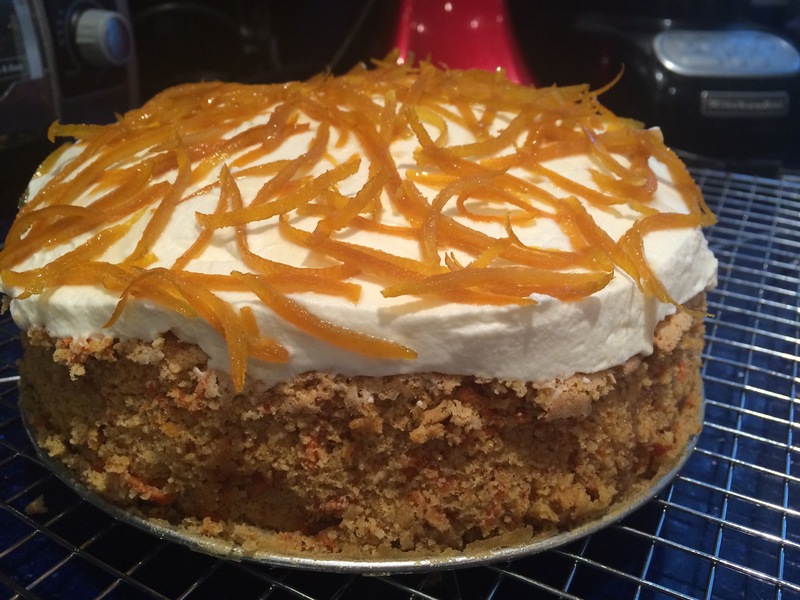 This cake is moist and soft, and tastes like a traditional carrot cake but looks all prettied-up; Adapted from Diethood’s Flourless Carrot Cake with Mascarpone Frosting and Martha Stewart’s Candied Orange Peel; Makes one 8″ cake. Make long strips of orange zest using a citrus zester or julienne peeler. Place the zest in a pot and cover with cold water. Bring to a boil, then drain off the water. Do this twice more, using fresh cold water, to soften the peel. Pour the sugar into an empty pot along with 1 1/2 cups of water. Bring to a boil, and stir until the sugar is dissolved. Add the peel to the boiling syrup mixture and lower the heat to a simmer. Simmer for 12 minutes, until the peel strips are translucent. Remove from the heat, but leave the strips to cool in the syrup for 1 hour. Remove the strips from the syrup and spread out on parchment or wax paper to dry. Preheat oven to 325F. Grease an 8″ springform pan with butter and dust with gluten-free flour. In the bowl of a stand mixer fitted with the whisk attachment, beat egg whites and cream of tartar together on high speed, until you have soft peaks. Add the 2 Tablespoons of sugar, and beat on high speed until you have stiff peaks. Set aside. In a separate bowl, combine the 1 cup of sugar, the egg yolks, orange zest, cinnamon, salt, almond extract, and vanilla. Beat on medium-high until the mixture becomes pale and smooth, about 2 minutes. 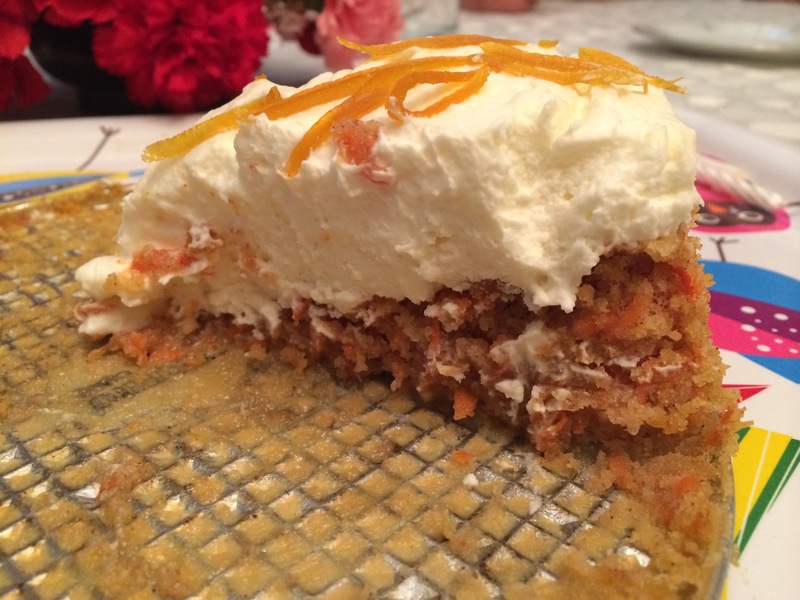 Fold in the grated carrots, and a third of the egg whites mixture, using a spatula. Fold in the almond flour until completely incorporated, then fold in the remaining egg whites. Pour the batter into the prepared springform pan, and bake at 325F for 45 minutes, until a toothpick inserted into the centre comes out clean. Transfer to a wire rack, and let cool in the pan. While the cake is cooling, make your Mascarpone Frosting. Pour the cream into the bowl of a stand mixer, fitted with the whisk attachment. Beat the cream on medium speed, until you have stiff peaks. In a separate bowl, combine the mascarpone & sugar with a spatula until smooth (get rid of all those lumps!). Gently fold in the whipped cream, and keep folding the mixture until all of the ingredients are completely incorporated. Run a knife (or palette knife) around the outside edge of the cake, to help it separate from the springform pan. Remove the sides of the pan, leaving the cooled cake on its metal base. 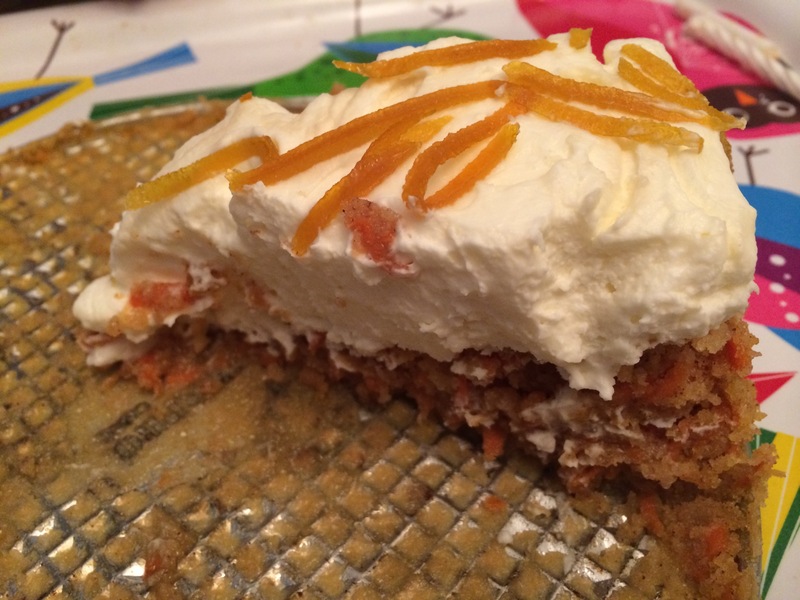 Spread the Mascarpone Frosting over the cooled cake, and decorate with the strips of Candied Orange Peel. Serve big slices, and enjoy! This looks absolutely fantastic! 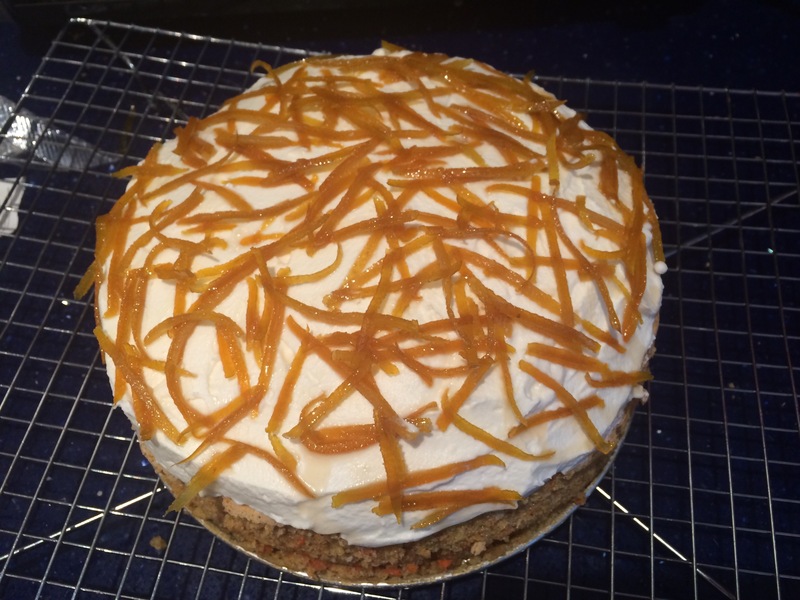 My mother-in-law needs gluten free foods sot his will be perfect to make to take to her house. Thanks for inventing it and posting the recipe!!!! You’re so welcome! I hope you and your mother-in-law like it!